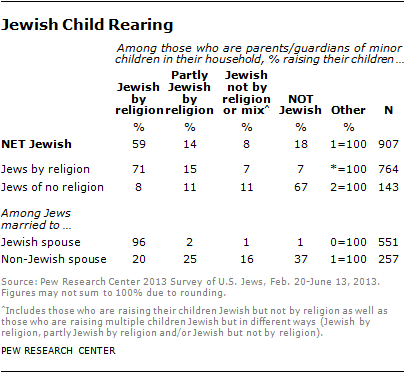 This report focuses primarily on Jews by religion and Jews of no religion, which are combined into a “net” Jewish category. The size and characteristics of people of Jewish background and Jewish affinity are summarized in Chapter 1 (Population Estimates) and Chapter 7 (People of Jewish Background and Jewish Affinity). 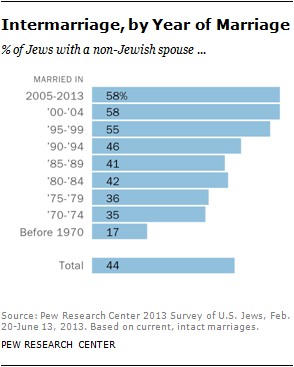 The Pew Research Center’s 2013 survey of U.S. Jews was conducted by the center’s Religion & Public Life Project with generous funding from The Pew Charitable Trusts and the Neubauer Family Foundation. Many Pew Research Center staff members contributed to this effort. Alan Cooperman oversaw the research project and served as lead editor of the report. Gregory Smith took the lead in the development of the survey instrument and sampling plan as well as the analysis of the results. Conrad Hackett and Noble Kuriakose developed the population estimates. The report’s overview was written by Cooperman and Smith. Chapters 1 and 2 were written by Hackett, Smith, Cooperman and Kuriakose. Chapter 3 was written by Smith and Fatima Ghani. Besheer Mohamed and Juliana Horowitz wrote Chapters 4 and 5. Elizabeth Sciupac wrote Chapters 6 and 7. Smith, Hackett and Mohamed drafted Appendix A (Methodology). The report was number checked by Phillip Connor, Kathleen Flynn, Cary Funk, Jessica Martinez, Michael Robbins and Neha Sahgal as well as Ghani, Hackett, Kuriakose, Mohamed, Sciupac and Smith. Others at the Pew Research Center who provided editorial or research guidance include Alan Murray, Andrew Kohut, Paul Taylor, Scott Keeter, Jon Cohen and Jeffrey Passel. Leah Christian, formerly a Pew Research Center senior researcher, also contributed to the project. Other staff members who contributed include Sandra Stencel, Erin O’Connell, Michael Lipka, Joseph Liu, Tracy Miller, Adam Nekola, Liga Plaveniece, Carla Ritz, Stacy Rosenberg, Bethany Smith, Bill Webster and Diana Yoo. Fieldwork for the survey was carried out by the firm Abt SRBI, with Benjamin Phillips as project manager and Stas Kolenikov as lead statistician. Abt SRBI’s Mark Schulman, Chintan Turakhia and Charles DiSogra reviewed the weighting of the survey. The Pew Research Center received invaluable advice on the survey questionnaire, methodology and analysis of results from a panel of advisers that included several of the leading figures in the study of American Jewry: Rabbi B. Elka Abrahamson, President of The Wexner Foundation, New Albany, Ohio; Sarah Bunin Benor, Associate Professor of Contemporary Jewish Studies, Hebrew Union College-Jewish Institute of Religion, Los Angeles; Steven M. Cohen, Research Professor of Jewish Social Policy at Hebrew Union College-Jewish Institute of Religion and Director of the Berman Jewish Policy Archive at NYU Wagner; Sergio DellaPergola, Shlomo Argov Professor Emeritus of Israel-Diaspora Relations at The Hebrew University of Jerusalem; David Dutwin, Executive Vice President and Chief Methodologist, Social Science Research Solutions, Media, Pa.; Jane Eisner, Editor-in-Chief, The Jewish Daily Forward, New York City; Laurence Kotler-Berkowitz, Senior Director of Research and Analysis and Director of the Berman Jewish DataBank at The Jewish Federations of North America, New York City; Jonathan Sarna, Joseph H. & Belle R. Braun Professor of American Jewish History at Brandeis University, Waltham, Mass. ; Leonard Saxe, Klutznick Professor of Contemporary Jewish Studies and Social Policy at Brandeis University and Director of the university’s Cohen Center for Modern Jewish Studies and the Steinhardt Social Research Institute; Jack Wertheimer, Joseph and Martha Mendelson Professor of American Jewish History at The Jewish Theological Seminary, New York City; and Leon Wieseltier, Literary Editor of The New Republic, Washington, D.C. 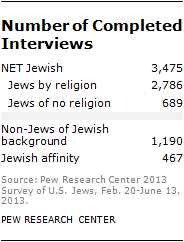 In addition, the Pew Research Center’s Religion & Public Life Project would like to thank several other institutions and individuals who generously provided data and advice: Elizabeth Tighe, Matthew Boxer and Charles Kadushin at the Steinhardt Social Research Institute at Brandeis University; Samuel Heilman, Distinguished Professor of Sociology and Harold Proshansky Chair in Jewish Studies at Queens College, CUNY; Bruce A. Phillips, Professor of Jewish Communal Service in the Louchheim School of Judaic Studies at Hebrew Union College-Jewish Institute of Religion and the University of Southern California, Los Angeles; and John C. Green, Director of the Ray C. Bliss Institute of Applied Politics and Distinguished Professor of Political Science at the University of Akron, Ohio. 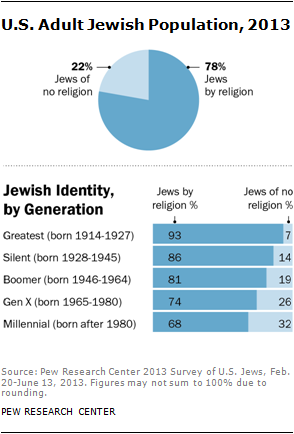 The rest of this report details the survey’s findings on the size, beliefs, practices and attitudes of the U.S. Jewish population. 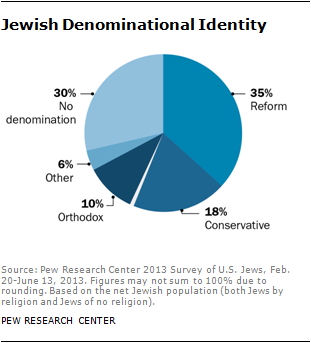 The first section estimates the size of the American Jewish population using various definitions of who is a Jew. The second section covers intermarriage and demographic characteristics, such as age, education and income. The third section examines aspects of Jewish identity, including questions about what is essential to Jewish identity, what is incompatible with being Jewish, friendship networks, Jewish education and child rearing. The fourth section explores religious beliefs and practices, including attendance at religious services, lighting Sabbath candles and participating in the Passover meal. The fifth section looks at attitudes toward and connection with Israel, including views on a two-state solution and the Israeli-Palestinian peace process. The sixth section discusses political views and social attitudes, including political party identification, views of President Obama, attitudes toward homosexuality and perceptions of discrimination. 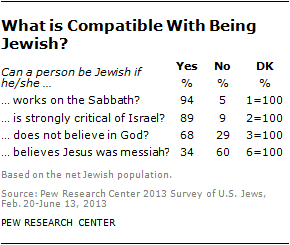 The seventh section describes the characteristics of people of Jewish background and Jewish affinity, including their answers to an open-ended question about the ways in which they consider themselves Jewish. The survey methodology, topline and full questionnaire are included in appendices. The online version of the report includes two interactive features – one illustrating Jewish denominational switching and the other allowing the user to calculate the size of the Jewish population based on his or her own definition of who is a Jew.